ACORN members rallied across Ontario today, outraged at the Province’s Increasing Housing Supply consultation. The consultation document reads like a developer’s dream list, and the government has seemingly pre-determined that the solution to Ontario’s housing crisis is to give more powers to big developers while ignoring the needs of tenants. In response, ACORN members in Peel, Ottawa, Hamilton, and Toronto delivered hundreds of consultation submissions to MPPs and other representatives. Did you miss the action today? Click here to take action in solidarity! 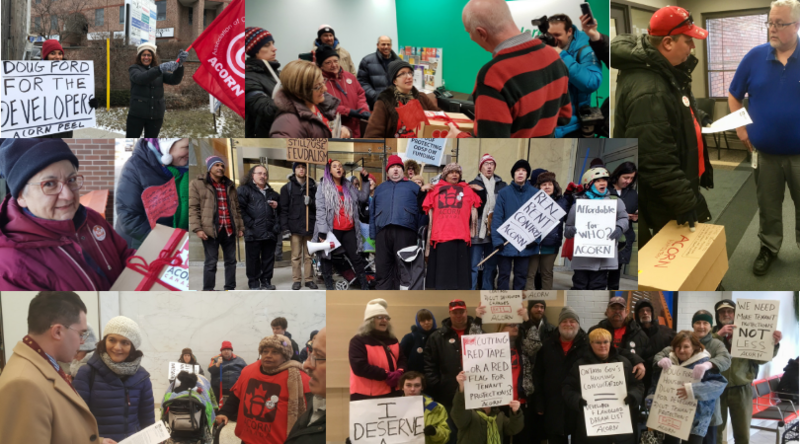 Twenty-eight Toronto ACORN members went down to the Ministry of Housing to deliver our submissions to the flawed Increasing Housing Supply in Ontario consultation. Members were joined by MPPs Suze Morrison, Peter Tabuns and Jessica Bell. This rally came one day after yet another homeless death on the streets of Toronto and our members spoke passionately about the need for real and deeply affordable housing to address the city’s housing crisis. Members of the media spoke with ACORN leaders as well as the MPPs who came out in support. After a series of chants and speeches, ACORN members marched into the Ministry of Housing, where they were met by a staff person who accepted our "Red Tape or Red Flag?" package and a letter demanding a meeting. They agreed to a meeting with ACORN leaders to discuss our demands. Stay tuned, there's more to come! Twenty Hamilton ACORN members rallied outside the Ellen Fairclough Building today to bring attention to flaws in the Province's Increasing Housing Supply consultation. With local MPP Donna Skelly's office not transit accessible, Hamilton chair Mike Wood delivered our submissions to staff that the Landlord Tenant Board to pass on to Housing Minister Steve Clark. Outside, ACORN leaders spoke about rising rents and displacement issues in Hamilton and made a call to MPP Skelly to share our demands. Members delivered our demand the letter and massive stack of submission papers to Mississauga East Cooksville MPP Kaleed Rasheed. After some negotiating, members entered his office and have arranged a meeting for next week to discuss our demands in more detail. Toronto ACORN leader Alejandra Ruiz even managed to give members a briefing on the excitement in Toronto via telephone! Seventeen Ottawa ACORN members gathered outside of MPP Jeremy Roberts' office in Ottawa-West Nepean to deliver over 930 pages of tenant consultation submissions. The action started with speeches from ACORN tenant leaders, Mavis Finnamore and Norma-Jean Quibbell, two members who know first-hand the impact of our city's affordable housing crisis! Mavis' home of 30 years in Herongate was demolished in 2016 to make room for luxury rentals and Norma-Jean has faced two AGIs in the past two years. Members spoke with Jeremy Roberts' staff about ACORN's demands for investments in affordable housing and tenant protections, and presented him with a decorated box containing our tenant submissions.